Not too long ago, I wrote a post called Mom 2.0 better than Mom 1.0 highlighting nine ways Megan (Mom 2.0) has outdone her mother (me, Mom 1.0). Well, she's gone and done it again -- taken what I've taught her and bumped it up a notch. Consider this post reason No. 10 why Mom 2.0 is better than Mom 1.0. 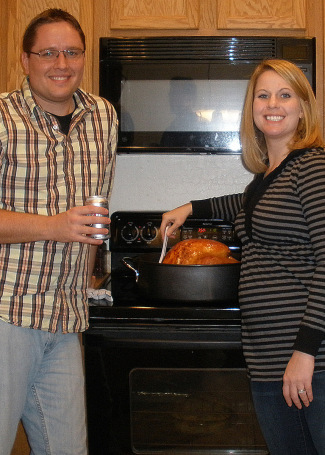 As many of you know, Megan and Preston hosted our Thanksgiving gathering this year. Megan has never prepared the Thanksgiving meal and has only once cooked a turkey by herself. Yet she took it upon herself to do something I have never done, something I had previously never even heard of: Megan brined the Thanksgiving turkey. And I must admit, it turned out to be the most delectably moist and flavorful turkey I think I've ever had. Megan soaked the turkey in a savory solution for a day or so. 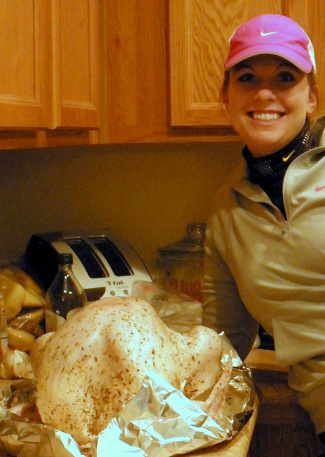 Then she seasoned it well (before taking off for the Turkey Trot, I might add). She baked it and basted it and recruited Preston for the heavy lifting of the 20-pound tom in and out of the oven. Once roasted to golden perfection, Preston carved the bird -- his first time ever charged with Thanksgiving carving duty. What a turkey! What a team! Yes indeed, Mom 2.0 once again improves upon Mom 1.0. And it's only right to throw in a few props for Dad 2.0 (Preston) for doing the carving honors -- something Dad 1.0 (Jim) has yet to attempt. In light of the savory success of Megan's turkey brining, I'm thinking about trying out the method soon myself. I just so happen to have a spare turkey in the freezer, happily waiting to be brined and baked. And maybe -- just maybe -- Jim will be happily waiting to try out carving the bird himself once it's done. These kids of mine continually amaze me. I thought I was the one who was supposed to be teaching them a thing or two, yet they've been pretty darn good so far at teaching me a thing or two. For starters, that soaking a turkey in salt water really does make it more moist. And that it really is possible to run a 5k in the morning and still get Thanksgiving dinner on the table by early afternoon. Doing both while pregnant. Did I mention that my kids continually amaze me? What's something you've learned from one you're more typically in charge of teaching (a child, grandchild ... pet? )?